There's only two things that you absolutely need in hair care and one of them is shampoo. Sure, you may not use it very often, but when you do, what's your favorite? Depending on your hair type and the thickness of your hair, you may have a shampoo must-have. And if not, here's a consumer-choice list of the best shampoos for waves, curls and kinks. Before diving into the official list, there are some disclaimers. For one thing, even if the best shampoos are rated highly or even at the top, they may not be right for you. There are hundreds of hair care brands out there and all of them have positive aspects and drawbacks. It all comes down to what's in them and what's right for your curls. First, look at the ingredient list. 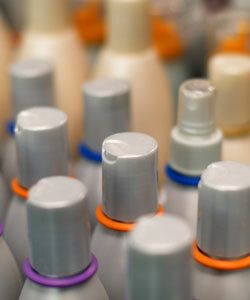 Many drugstores and grocery stores carry brand name hair care products. These are the most accessible place to find a shampoo. Then there are professional salons and hair care stores that also carry shampoos, but they might be slightly more expensive. So what's best? The answer is a difficult one, but may best be answered by the list of ingredients. Some products, including shampoos, contain silicones that are highly debated in the hair community. A lot of professionals suggest not only avoiding silicones that can create a waxy buildup, but sulfates, TEA, MEA, sulfur, paraffin, ammonia, and other damaging ingredients as well. Another thing to keep in mind is whether the product is a well-known brand name. Many highly rated major brand names contain ingredients that your hair won't want. Pantene Pro V, the top must-have shampoo for wavy hair, contains a waxy buildup that most women like. However, check the ingredients carefully. If it contains any sulfates (including sodium lauryl or ammonium lauryl sulfate), it's probably best to avoid. So even if it's considered a must-have for some, always read the labels and do the research. After all, the best way to find a must-have product is by doing a little bit of homework first. We did a little research for you though and gathered up the best shampoos based on hair type! When it comes to wavy hair, there are many prominent consumer choice must-haves. Those with type 2 waves consider L'Oreal, Garnier, and several other brand names as must-haves in their shower. Rounding out the top picks for must-have shampoo are Sunsilk and Pantene Pro V. These products tend to cause some residue buildup, so have some clarifying shampoo on hand. That being said, they're favorites for a reason. So wavies dig in, and tell us what you like best! When you approach the official curly bench mark, your best bet is to choose your shampoo wisely. In the case of hair care, conditioners are not the only moisturizing products in the tub; there are plenty of moisturizing and clarifying shampoos that are perfect for type 3 hair everywhere. For curlies with type 3 curls, the top choices for must-have shampoo include the Garnier Fructis brand, Kérastase Bain Oleo-Curl/Intense, and for thicker hair, TiGi Bedhead Superstar Sulfate-free Shampoo For Thick Massive Hair. Once you get into the tighter, kinkier curls, things get a little, well, hairy. Unfortunately, not just the type of shampoo, but the use of it altogether is called into question. In some cases, it's best to either only condition, co-wash, or carefully shampoo in multiple sections. If you prefer to use shampoo, however, there are a few at the top. Aubrey Organics is one of the top brands to be considered a must-have shampoo for all curlies out there, while DevaCurl Low Poo is a favorite for 3c through 4 type hair. Browse thousands of user-reviewed shampoos and find your new miracle product today! Remember that you don't have to shampoo your entire head. Focus on the scalp to avoid drying our your gorgeous locks. In spite of the fact that these are considered the best shampoos by many, they should not be used alone. Remember to use a clarifying shampoo at least once a week to remove waxy buildup and follow up with a moisturizing shampoo. This will prevent dandruff and itchy scalp if you have it. These brand names are recommendations solely based on hair type. There are dozens more that are fantastic for itchy scalp, sensitive scalp, thin hair, thick hair and chemically treated hair.